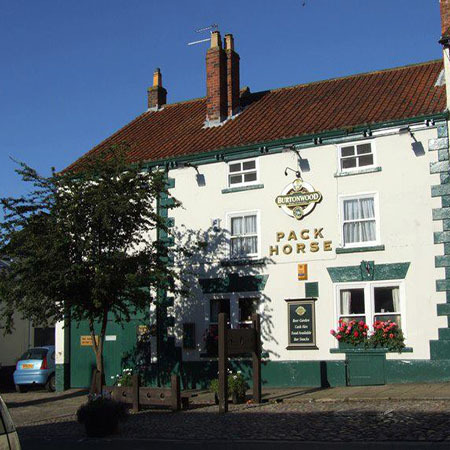 The Pack Horse Inn is situated in the historical Old Town of Bridlington and is the second oldest pub in the town dating back to 1600, when it was a thatched coaching house. You could catch a twice daily stage coach to York when the main road was Green Dragon Lane which runs along the back of the pub. The pub has been lovingly restored by it’s owners and has kept many original features, which add to the intrigue and atmosphere of this historical building. The Pack Horse Inn is proud of their hand pulled real ales, lagers and fruit ciders. The pub is the exclusive outlet for Bridlington Brewery - the towns only micro brewery with ales such as Old Town Rogue, Bridlington Jackdaw, Moe and Blackjack - please refer to the Bridlington Brewery facebook page for up to date information on ales currently in the brewing progress. Food is served at the Pack Horse Inn, lunchtimes between 12.00 and 2.00 (except Sunday & Mondays) - selling a variety of meals such as hot and cold sandwiches, fish & chips and of course the famous Pack Horse pie (a must for pie lovers). The Pack Horse is the perfect stop for Cyclists doing the Way of the Roses. Please enquire about our newly furnished suit style rooms. 5 of us lunch, Great home cooked food very hot, great friendly staff. would recommend the steak and ale pie. would recommend you book. A great pub. Thanks to all the staff, we all will be back. We had Sunday roast here and it was gorgeous-you get a really good plate full too!-we also had a sweet which are out of this world and it helps that the staff are so friendly and helpful and very welcoming!-The pub/restaurant has a lovely atmosphere and its very relaxing. What a lovely charming inn. I visited this inn with a local patron on a couple of occasions and I found it to be a charming, most welcoming and a lovely place. The manager, Jason, was very friendly, and welcoming who made the experience of eating and drinking in a gastro pub very nice indeed. The food was well cooked, the service was fast and the meal was very tasty and plentiful, even though there was a limited choice. Even the regulars were nice too, something to be said as in many parts of Yorkshire they can be threatening when you enter someone else's turf. Jason runs a good ship so to speak. The only downside here were that there were too many chalk boards advertising the delicious food and no menus on the tables. Will definitely be in here again when I go back home to sunny Yorkshire. A God's pub in the God's county. Had the roast pork dinner mmmm. Crackling stuffing and pigs in bank let. Home made Yorkshire Puddings. Roast, mash spuds, roast parsnips and 4 other veg. 2 others has roast, hunters chicken and Italian meat balls. Large portions all perfectly cooked and homemade. Will definitely try again. In a town sadly lacking in good pubs and bars the Pack Horse stands out as the best we have visited in Brid. Lovely home cooked food, friendly staff and locals and a good choice of beers make it one well worth finding. Really enjoyed our time there and will be back.